La version anglaise de mon deuxième roman sera disponible en format numérique sur les sites des librairies le 1er septembre. Il a été traduit par mon fils Mathieu, également auteur de six romans de science-fiction de la série "Le Trench". Il a aussi traduit les trois albums jeunesse que j'ai écrits : Une amitié explosive (An Explosive Friendship), Le grand Projet (The Big Project), Pyro fugue (Pyro Runs Away). L'illustration de la couverture est de Jocelyn Jalette, romancier, bédéiste et caricaturiste de Joliette. Il a également réalisé l'illustration des deuxième et troisième albums de la série jeunesse "Pyro et Glucosine". reflections of an adult and the musings of a child, resulting in a very entertaining back-and-forth. 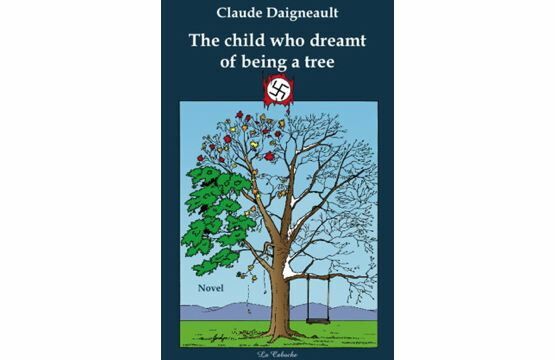 ‘The Child Who Dreamt of Becoming a Tree’ offers a wonderful glimpse inside the imagination of a sensitive little boy whom we, as readers, quickly grow attached to. Hats off to the author!’ (Jean-Denis Côté, ‘Québec français’.) "
In the weeks following the end of World War II, we follow the adventures of a five-year-old boy as he lives secluded in his home, shut off from the rest of the world by his mother, who’s developed an irrepressible fear of him getting hurt should she ever let him go outside and play with other children. Helped along by his wheelchair-bound grandfather, a man who’s lost the use of his voice after a stroke and who never stops encouraging him to dream, the cloistered Julien is nonetheless determined to discover all of the secrets life has to offer. Peering through the doorway of his wardrobe, his favorite hiding place, Julien observes the adults evolving all around him, using the power of his imagination to try and understand their odd behavior. Spending long moments sitting in front of the window, he longs for freedom, dreaming of what it would be like to be tree, as his mother would always know that he’s never far from home and that he’s always safe. But over the course of his young life, Julien will become an involuntary witness to family dramas that will shake him to his very foundations for years to come.